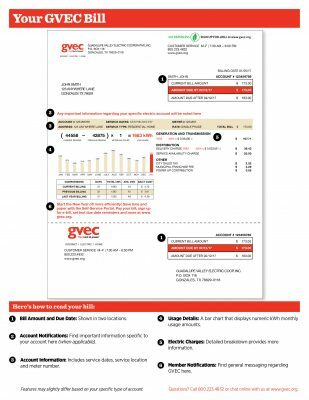 Learn how to read your bill and how rates are calculated. If you have any billing questions, call a Customer Service Representative at 800.223.4832 or send us an email at info@gvec.org. Signing up for SmartHub gives you access to Usage Explorer, our free energy management tool. Use it to monitor and analyze your energy usage by the hour, day and month; compare your usage with the daily temperature; and review past usage for ongoing comparisons. Understanding your home’s usage patterns can be an important step toward conserving energy for a lower electric bill. By identifying fluctuations in usage and comparing them with the daily high and low temperatures, for example, you’ll be able to gain insight into how weather—especially in the summer and winter—impacts usage in your home. To learn more about Usage Explorer and the many variables that affect a home’s energy usage, call one of our energy solutions specialists. As GVEC’s energy experts, they are here to help members become more energy efficient with free in-home energy audits and energy efficiency recommendations. Learn more.